After several weeks of inactivity on the experimental cooking front, I finally found the right occasion to get rid of all “not enough time”-excuses, to drop all other so-called priorities and to spend some time in my precious 4m² kitchen: My significant other celebrated his 30th birthday and I was determined to get some decent party food on the table. A few weeks ago I had found a recipe for an impressive four-layer chocolate cake by Ron Ben-Israel, a pastry maker famous for his wedding cakes, who started his career as a dancer but then traded in his ballet shoes for kitchen tools when he fell in love with a chocolatier. Quite a nice story indeed, but honestly, I hadn’t heard of the guy before I read the recipe article in Food Network Magazine’s latest Chocolate Issue. Alhtough usually I’m not a big fan of pretentious cakes, this recipe surely caught my attention. Armed with over 1kg of chocolate and an equal amount of sugar, I started what was going to be a baking project that was maybe a bit more ambitious than I had initially foreseen. Along the way I faced a kitchen cupboard entirely covered in melted chocolate – though I must admit this was more because of my own stupidity than any challenge in the recipe itself. There is a picture capturing the glorious moment of me spilling a bucket worth of chocolate dough, but I prefer not to make that one public. I struggled a bit, but with the help of two lovely sisters, I succeeded in finishing my cake project before my birthday man arrived home from work that evening. I altered a few details in the recipe, such as lowering the amount of coffee – because that is one of the very few things in life that I absolutely don’t like, as well as not adding the vanilla extract that the original recipe asked for – simply because I forgot to add it. Baking the cake was, well, a piece of cake. Creating the bark decorations on the side wasn’t too difficult neither. Compiling the tower of layers – I ended up with 6 instead of 4, was a bit tougher, but I would still recommend anyone willing to spend a few hours on this project to give it a try, you’ll be happily surprised with the result. When The Cake was cut during the party the next day, not only was I happy to see that this calorie bomb could easily feed a small army, the crowd also unanimously agreed this was very decent party food. To make the batter, pour the coffee into a bowl and whisk in the cocoa powder. Put the flour, salt, baking soda, baking powder and sugar in another bowl and mix (preferably use a stand mixer) on low speed for about 1 minute. Add the eggs, vegetable oil and 450ml of water (and 4 tsp vanilla extract if you prefer not to forget them unlike me), then beat on medium speed for about 5 minutes. Reduce the speed to low and beat in the coffee-cocoa mixture in a slow stream until combined. Pre-heat the oven to 180°C and bake the batter in a baking shape of about 25cm diameter. You will need to repeat this step to use all your batter. Baking time will be anything between 50 and 80 minutes, depending on the height of your baking tray. Check with a skewer to make sure the cake is all done, the skewer should come out clean when inserted and removed from the cake. Leave to cool. To make the ganache, bring the cream close to cooking point, then add the chopped bittersweet chocolate and whisk until smooth. Chill, often stirring, until the ganache is cool but not stiff. This might take up to 30 minutes, depending how fast your cooling process goes. The bark is surprisingly easy to make. All you need is a set of two plastic sheet protectors and a zip-top bag. Melt the white chocolate and insert into the zip-top bag, snipe a corner and pipe thin lines of white chocolate over the sheets in a pattern you like. Refrigerate the baking sheets until the white chocolate is set (this will take only about 15 minutes), then repeat the process with milk chocolate. Finally, add a full covering layer of melted bittersweet chocolate and refrigerate until hard. To finish, carefully peel the sheet protectors off the chocolate and break into random pieces. 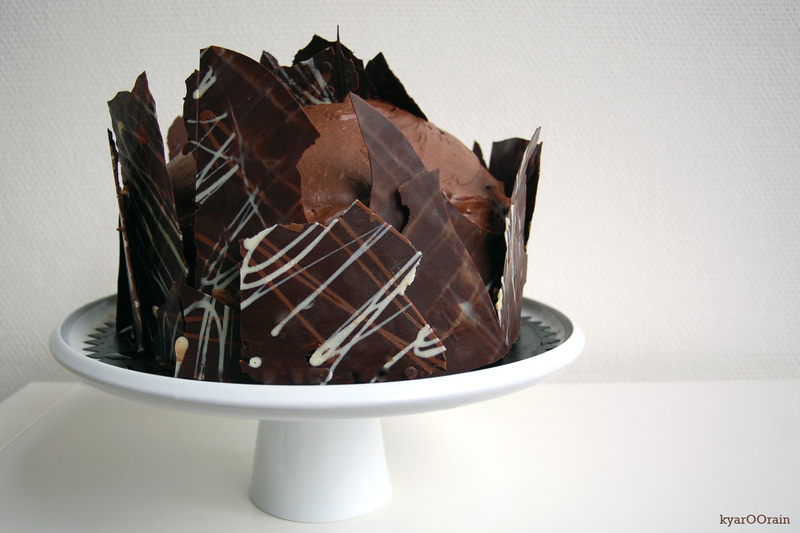 Slice both of your chocolate cakes into two or three layers, depending on the height of your cakes. I used a cake saw for this job, which makes it very easy. Place one cake layer on a cake stand and spoon some whipped ganache on top. Make sure to smoothen the ganache to avoid your cake looking like the leaning Tower of Pisa. Repeat to sandwich all cake layers, then spread all of the remaining ganache over the top and sides of the cake. Finish the decoration by sticking chocolate bark pieces against the sides. Use some ganache leftovers to help the pieces stick, if necessary.